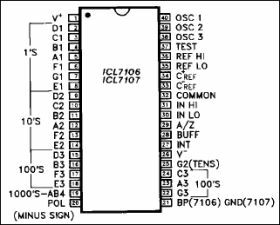 Create a design and simulate using EE-Sim® tools: The Maxim ICL7106/ICL7107 are monolithic analog-to-digital converters (ADCs). They have very high input impedances and require no external display drive circuitry. On-board active components include polarity and digit drivers, segment decoders, voltage reference and a clock circuit. The ICL7106 will directly drive a nonmultiplexed liquid crystal display (LCD), whereas the ICL7107 will directly drive a common anode light emitting diode (LED) display. Versatility and accuracy are inherent features of these converters. The dual-slope conversion technique automatically rejects interference signals common in industrial environments. The true differential input and reference are particularly useful when making ratiometric measurements (ohms or bridge transducers). Maxim has added a zero-integrator phase to the ICL7106 and ICL7107, eliminating overrange hangover and hysteresis effects. Finally, these devices offer high accuracy by lowering rollover error to less than one count and zero reading drift to less than 1µV/°C. These devices are used in a wide range of digital panel meter applications. Most applications, however, involve the measurement and display of analog data.